Rush-hour traffic on U.S. Highway 160 passes under the Bridge to Nowhere interchange at Grandview on Wednesday evening. The interchange has received little use since opening in November. A $47 million highway project east of Durango has received minimal use since opening two months ago. The interchange, which includes the so-called Bridge to Nowhere, is barely used during most hours of the day. But the Colorado Department of Transportation, which built the interchange, isnt calling it a failure. Officials with the agency say the structure merely is ahead of its time. Those who do use it tend to live on the south side of U.S. Highway 160 in an area known as Grandview, which has fewer than 100 homes. And only about half of those residents use the interchange; the others prefer to use access points farther east along the highway, residents said. Overall, I think its an incredible waste of money, said Peg Ochsenreiter, who has lived in Grandview for 18 years. The interchange includes a roundabout, a partial footpath, four bridges (including two that span Highway 160), six retaining walls, and on- and off-ramps. In Southwest Colorado, there is only one other overpass, the one that crosses Highway 160 at Mesa Verde. 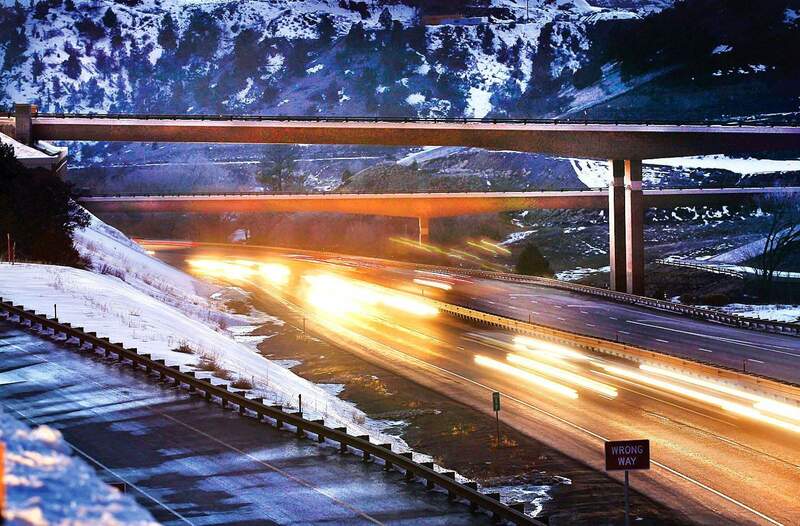 CDOT officials acknowledge the interchange receives little use. But they said it was built with the future in mind. The city and the county are considering building a road to the interchange to serve big-box stores that could locate there, and the county is moving forward with plans to build a fairgrounds and events center in the area. The web of bridges was supposed to connect with U.S. Highway 550 south, which leads to New Mexico. But CDOT hit snags with realigning Highway 550 across a private ranch. The agency describes the hiccups this way: A gas well was discovered in the selected alignment across the ranch, which required CDOT to find a new alignment, and in doing so, it discovered a portion of the ranch was eligible for the National Register of Historic Places. This set off a new environmental analysis, which again recommended crossing the historic ranch. The Federal Highway Administration is expected to issue a formal decision this year stating where the realignment will occur. CDOT projected traffic volume through the Grandview corridor to double from 19,200 vehicle trips per day in 2000 to 42,500 trips per day by 2025, not including new development in Grandview. Traffic did increase to 25,600 trips per day by 2008, but it since has declined to 19,000 trips per day. If Highway 550 is ever to connect to the interchange, it will have to cross the property of Martha and Chris Webb. CDOT already has filed one lawsuit against the Webbs for condemnation of a different piece of property near the interchange. La Plata County Commissioner Wally White said he is amazed that a government agency would go forward with a project of this size and expenditure without first obtaining the necessary right of way. I just cant imagine starting a project without having all the ducks in a row, he said. CDOT said the realignment of Highway 550 is a separate project, and the right of way will be acquired before construction of that project. White, who lives in Grandview, said he has seen only a few cars using the interchange during his travels to and from town. He doesnt use the interchange. CDOT has not counted traffic movements since opening the interchange. We really dont need that right now, said Mike McVaugh, CDOT Region 5 traffic and safety engineer. The Herald spent an hour counting cars on the interchange from 3 to 4 p.m. Jan. 20. Only 14 vehicles used the interchange during the hour. If it were a toll road, and that level of usage remained steady 24 hours a day, seven days a week, drivers would be charged almost $13 per trip in order to pay for the interchange in 30 years. But it is not a toll road. The project was paid for with $28.5 million in state funds, $14.4 million in federal funds and $3.6 million in stimulus funds. CDOT estimates it will cost an additional $84 million to realign Highway 550 across the Webb property and connect it to the interchange. The Bridge to Nowhere abuts a hillside that would need to be excavated to link the highway. CDOT estimates it will have to remove 1.6 million cubic yards of earth before linking the two roads. That is equal to 80,000 big-belly dump-truckloads, or enough to fill the lap pool and leisure pool at the Durango Community Recreation Center 740 times. Theres a significant amount of work to be done there to make it useful as well as safe during periods of snow and ice, White said. Ochsenreiter said the interchange becomes dangerous during cold weather. Dylan Kidd, who lives in south Grandview, also complained of ice. He uses the interchange regularly. Kidd was unaware of the $47 million price tag. Thats a lot of money for not a lot of traffic, he said. McVaugh said it is common for bridges to freeze over before the rest of the road. There is no design flaw that is causing them to ice over; in fact, engineers installed conduits on all four bridges that likely will disperse magnesium chloride as needed, he said. CDOT also will apply sand and salt mixtures as needed. White said the interchange could become beneficial in the long term with economic development and if more roads connect to it. Until then, it is likely to remain a curiosity. Several Grandview residents have said they watch drivers exit Highway 160, cross the Bridge to Nowhere and get right back on Highway 160 going in the same direction. Bobby Duran, a Grandview resident who claims to have given the Bridge to Nowhere its name, said he drove his old pickup over the bridge once before it opened to look around. He hasnt used the interchange since it opened.